It’s late in April 2018 and it’s 25°C. We have a mini heatwave happening across the UK and everyone is dressed in their shorts, summer dresses and shades. It feels as if we’re late in to the summer, everything is warm and the sun is rebounding from the pavements and windows. I live in Market Harborough and work in Leicester and today I have taken the train – which really is the best way to arrive in Nottingham – especially on a hot and busy day. The journey is fast and the countryside between the two Midlands towns is beautiful – an unsung part of the world in my view. I am heading to Nottingham for a business meeting and the location is the Hart’s Restaurant close to the Castle grounds and as I now know, a short and pleasant walk from the train station. Nottingham’s train station is a Victorian station that seems to function perfectly well with no obvious or incongruous modernisation. Nottingham’s tram line in to town is as modern as the train station is traditional and sits at an exact 90 degrees to the railway lines. 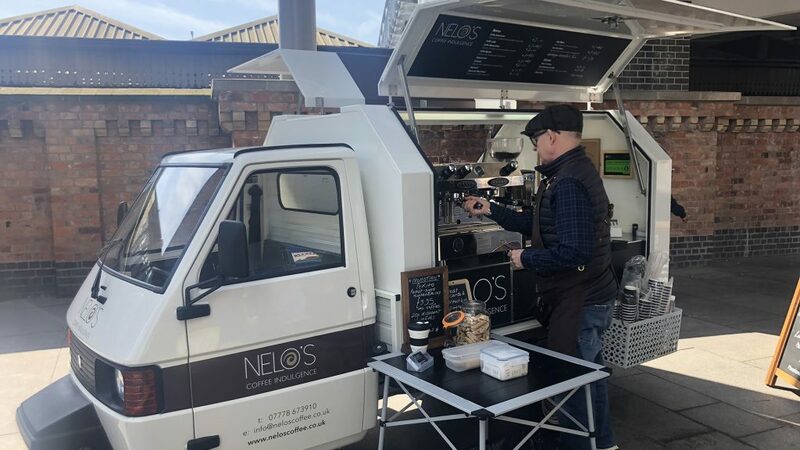 The area is untypical of many train stations with clear walkways and a large pedestrianised area with great coffee a few independent vendors selling (excellent) coffee an an attractive array of burritos (next time). Having left the station on the city centre side we walked underneath the tram line bridge and swiftly ‘Google Mapped’ Hart’s. I wouldn’t normally Google the directions, convinced that I will be able to navigate my way to the meeting on time, but I was with a colleague and felt responsible in getting us both their on the most efficient route. The weather was so good that any walk, of any distance would only be a pleasure. I have been to Nottingham a few times and walked from the station, I have travelled on the tram up to the Lace markets and walked directly from the station to the Motorpoint Arena. But I had never experienced the walk from the station to Hart’s on the route that Google advised. It took us along a fairly typical section of city centre dual carriageway (Castle Boulevard) before sending us right along Peverill Drive and in to the gated residence Park Estate. The sun was bright, the wind non-existent, lawns were being mowed and the owner of a beautiful small residence that seemed to merge in to the rock base of Nottingham’s castle was planting flowers. It honestly seemed as if we had stepped from one dimension to another. We had earlier passed Nottingham’s Museum of Life and the signs leading to the Nottingham Castle Museum and I instantly thought reminded myself to return with my wife and three daughters and re step the same walk, taking in the Museums and ending at Hart’s for lunch. From Peverill Drive we turned on to Ogle Drive and eventually Lenton Road which is simply one of the most beautiful pieces of road with residences and rock faces that would not look out of place along many areas of our British coastline – ironic given that we’re just about as far away from the sea as anyone can be in the UK. As we reached the top of Lenton Road, a meandering hill that you don’t quite realise is there until you reach the top and take stock of you climb, we then turned on to King Charles’s steps and in to Royal Standard Place and its outdoor theatre space with a rising circular gallery that leads towards Harts Hotel. It felt like an absolute bubble – enhanced of course by continental summer like sunshine in a month where the UK also had snow storms. The walk was delightful and also contributed to a feeling that we had earned the lunch we were about to enjoy. Our meeting began and we sat in an open doored, light and sun filled restaurant on a table for four. As the discussion began we learned more about Hart’s Restaurant and it’s special approach to serving its guests. It has a sister business (Hambleton Bakery) providing the daily baked artisan breads. It has the most perfectly simple menu that seemingly has every type of dish you could want from Game to Fish and Meats to Pasta. We learned about the menu from an excellent waiter who proudly sold in the Wild Garlic Velouté to start which was swiftly ordered by two of us. A homemade cauliflower soup and a salad completed our starter order and our mains included a delicate but wholly satisfying Cod dish, and a vegetarian dish of gnocchi that we now know is a part of the owners mission to provide vegetarians with carefully considered menu choices that are packed with ‘crunch and flavour’ as the antithesis to typically found vegetarian dishes. The last main course to be selected was the whole quail which really does help emphasise the diversity of the menu. The taste of the food, the meal as a whole and the service were impeccable and a perfect backdrop to a very positive meeting. Two hours had gone by and we finished with loose leaf teas and very very good coffee before heading off for the return walk back to the station. The lovely thing about the walk back is that it’s entirely downhill – what a considered location to place Hart’s restaurant. 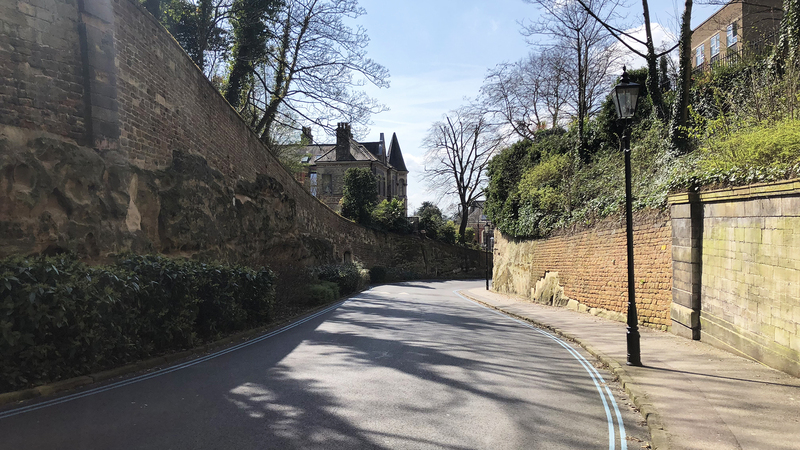 The walk back was interspersed with a iphone snaps of interesting (historic) architecture, the blossoming trees and the imposing rock base at the core of this hill by Nottingham’s castle. We arrived at the station and conveniently caught the next train back to Leicestershire – they depart every 30 minutes I believe and on a day like this I would not have minded to have ‘just missed’ one as the pedestrianised area adjacent to the station has ample coffee shops and a very interesting vintage store and of course ‘that’ burrito truck! 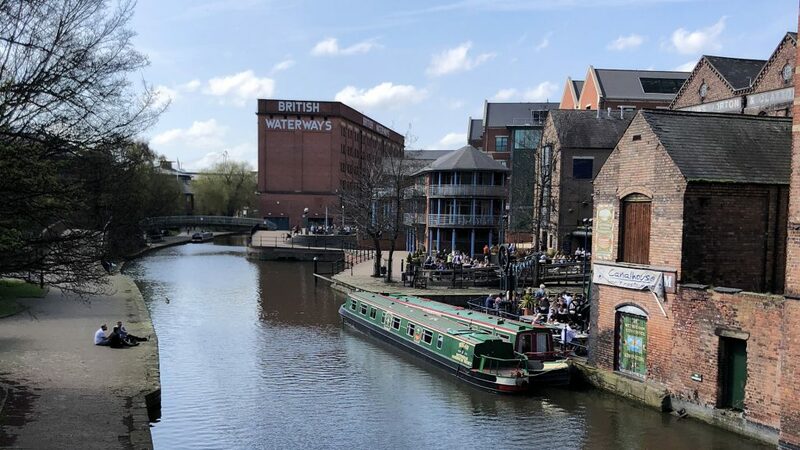 I am looking forward to a swift return and would recommend this to anybody living within reach of Nottingham, but if you can catch the train then what better way to spend an afternoon – had it not have been for business I think a glass or two of chardonnay would have been the way to go. Thank you Hart’s and thank you Nottingham.